A week in the life of a bus driver in the town of Paterson, New Jersey. There's a park in Paterson, New Jersey devoted to one former native, comedian Lou Costello. It may seem like a laughable idea, but I bet the residents of Paterson are proud of it. They should be proud of Paterson the movie too. In its poetry, paintings, songs and prose, America loves to celebrate the common man. Not so much in its cinema. In its movies, America generally prefers its heroes to be superhuman. While Springsteen, Whitman and Hopper can pay tribute to the unassuming masses who go about their daily, undramatic lives, filmmakers in the US are reticent to give us portrayals of such characters, perhaps in the misguided belief that mundanity equates to mediocrity. In other parts of the world, everyday existence is applauded, and in this context, Jim Jarmusch's latest movie - the story of a bus driver whose biggest dramatic moments involve his dog being mischievous and his vehicle breaking down - has more in common with the cinema of Iran or Japan. Clearly this is self-conscious on Jarmusch's part, as he casts Iran's Golshifteh Farahani and Japan's Masatoshi Nagase (outstanding in this year's Sweet Bean) in roles here. 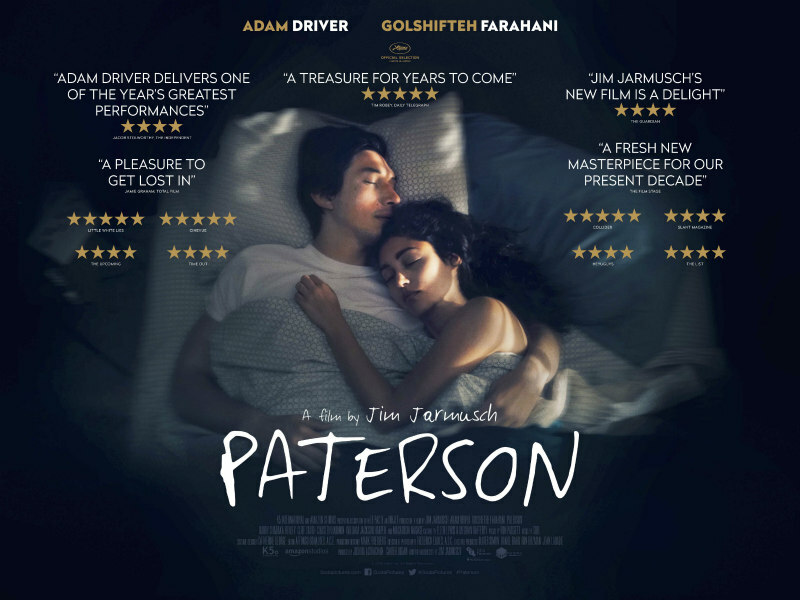 The title refers to both the film's setting, the town of Paterson, New Jersey, and its protagonist, Paterson (Adam Driver), a mild-mannered bus driver whose daily routine consists of driving his coach around the streets of the very definition of Everytown, USA, writing poetry on his lunch break, eating dinner with his adorable and ambitious Iranian wife Laura (Farahani), and hitting a local bar for a pint while out for an evening stroll with his dog (Palm Dog winner Nellie). It may not sound like much on paper, but a few days into this repeated routine and we begin to envy the modest existence Paterson has carved out for himself. So comfortable do we become with this cozy repetition that when it's interrupted by the arrival of the weekend it feels like a seismic disruption. Paterson is a talented poet, inspired by Paterson native William Carlos Williams, but he's content to share his words solely with his wife, who constantly pleads with him to submit them for publication, or at the very least, make a xerox of his beloved 'secret notebook'. He begins to come around to this idea, promising to make copies of the notebook at the weekend, but an encounter with a young girl whose own nascent poetry seems beyond her years stirs feelings of inadequacy in Paterson. Few are as vulnerable as those whose talent can't be measured by scientific means. There are moments of comedy that veer between the subtle and the surreal. Paterson notices twins everywhere - a pair of old men on a bench on his way to work, two brothers in the local bar, the young poetess and her sister - and when Laura takes him to see a rep screening of 1932's Island of Lost Souls, he is struck by the resemblance between his wife and actress Kathleen Burke, who plays that film's 'Panther Woman'. Like so many husbands, he's not so quick to pick up on the changes his wife makes to their home, as she gradually turns almost every piece of furnishing in the house a shade of black and white. The most explicit laugh is reserved for the reveal that explains why Paterson comes home to find his mailbox stand knocked over every day. Just as Paul Auster and Wayne Wang's '90s double bill of Smoke and Blue in the Face paid tribute to Brooklyn (the latter featuring a cameo by Jarmusch), Paterson celebrates a town in arguably the most derided state in the US. The scenes on Paterson's bus are reminiscent of Jafar Panahi's Taxi Tehran; through the interactions of various passengers, we learn the quietly proud history of a town that looks like a thousand others. At the local tavern, the landlord (Barry Shabaka Henley) displays portraits of local heroes behind his bar and is a mine of local lore. It's a masterclass in how to celebrate a heritage without sinking to jingoism. Paterson is in cinemas November 25th.